While cleaning up after sheet mulching under the grape trellis, I noticed the box cutter was missing. Yikes! The blade on that tool was open. I looked everywhere I could think of, then, I looked back at the six-inch thick layer of chips on top of overlapped bike boxes. Hmmm … under there somewhere? Many people were coming to the orchard soon, including kids. I visualized some child finding the box cutter. I knew I had better make an effort to find it. I asked Aurora Rents about renting a metal detector but the representative was hesitant since the lost tool was close to a metal fence. I needed advice from the pros. Mark emailed some general information about metal detectors and wrote that he would stop by the next time he was in Seattle. Wow! 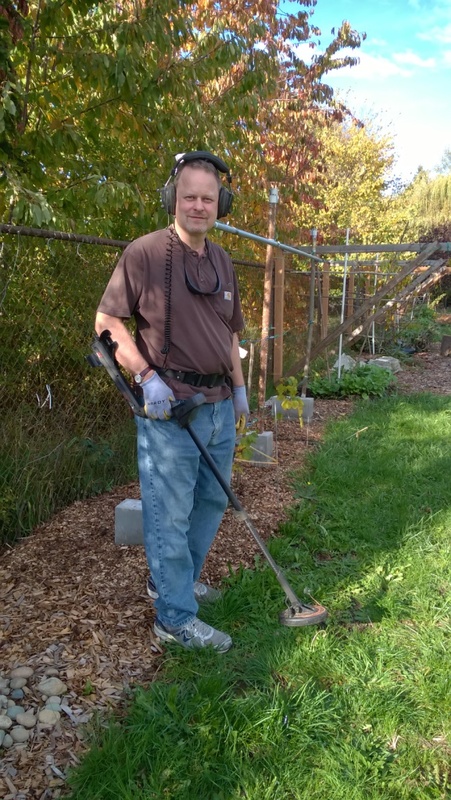 All metal detectors will detect underneath the coil but when they get to close to large metal items, such as our chain link fence, there will be interference. With a small diameter coil (3″), it might be possible to detect the object. He advised me to purchase a Garrett metal detector at KellyCo. An entry-level machine like the Ace-250 would do but it does not come with a small coil. Small coils are after market accessories. Mark and a friend pulled up to the orchard on Friday and took a few tools out of his truck. He explained that, being near a fence, the best procedure is to use sweeping motions, from the fence inward, listening for an extra tone to indicate more metal than just the fence. As we walked to the spot where I was sure I had lost the tool, he told me a story of a woman who was positive she lost her beloved engagement ring within a certain two-block area. Mark hunted with patience but came up empty handed. She called him a week later to say she found the ring in a sack of potatoes on her back porch. Mark turned on his detector in the grape chips and in six seconds he pulled up the box cutter! Easy peasy for a pro. It had not even rusted yet … still perfectly useful. I was thrilled and he was glad to get on his way. He said he had plenty to do to get ready for the club’s annual Moonlight Hunt, where they all go out with no flashlights and search for coins that are painted black. One of the coins will have a code and the finder will earn a nice new metal detector. I should show up at this event and just paw around on my hands and knees to search for that special coin! This is a re-post since WordPress ap Jetpack failed to notify subscribers of original post Oct 28. This entry was posted in Marketing & Outreach, Uncategorized and tagged Sheet Mulch, tool on October 31, 2016 by Ruth. This entry was posted in Marketing & Outreach, Uncategorized and tagged Sheet Mulch, tool on October 28, 2016 by Ruth.